The area in and around the Citadel is a place of adventure, history, nature and recreation. For centuries, this old military area was a vital link in Copenhagen’s defence against attack from the sea. As you approach from the city centre, cross the moat to the Citadel and enter through the ancient, stately royal gate, you find yourself walking back in time to the 1660s. Sailors once dwelt the long red buildings here, while the yellow building housed their commandant. Attached to the church is the prison where the famous Danish statesman Struensee, chained to the wall, awaited his execution. Encircling them all are ten-metre-high grassy ramparts, bastions with cannons and an old windmill. Visit in the right season and you will see wild tulips and beautiful white hyacinths. Just outside the Citadel is Churchill Park, home of the Gefion Fountain and St. Alban’s Anglican Church. 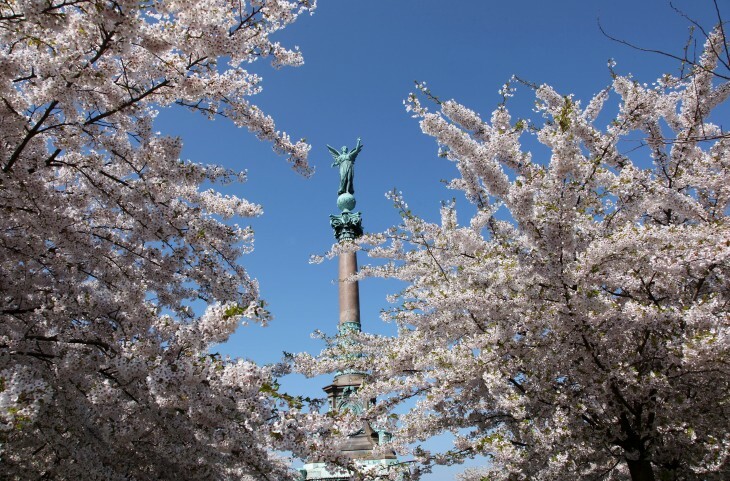 Cherry trees blossom in the spring out by Langelinie, where the Little Mermaid perches on her rock by the harbour entrance. There are children’s playgrounds at Langelinie and outside the Swedish Church, to the north-east of the Citadel. The Citadel moat is home to a rich population of waterfowl. On the ramparts and in the surrounding park, you can seek shelter under the sprawling trees, originally intended to foil the enemy’s attempts to survey the area during wartime, and to supply timber for stockades and repairs. The Citadel, which is Northern Europe’s finest and best-preserved fortification, and still houses military institutions, celebrates its 350th anniversary in 2014. The Citadel was inaugurated in 1664 and housed the absolute monarchy’s state prison, which still exists to this day. The prison building was attached to the church, so that prisoners could watch sermons through peepholes. In 1772, Struensee spent three months chained to the wall here, prior to his execution. In 1945, Werner Best, the former head of the German administration in Denmark, was imprisoned here after the occupation. Every May, Langeline is the site of the Sakura Festival, which celebrates the blossoming of 200 Japanese cherry trees. The trees were presented to the City of Copenhagen in 2006 by the Danish honorary consul in Hiroshima, Seiichi Takaki. There are 240 different herbs and types of grass in the Citadel, including garlic mustard, wild chervil, creeping campanula and shepherd’s purse. The moat is home to mallards, gadwalls, tufted ducks, coots, green-legged moorhens, mute swans, crested grebes, herons and cormorants. The area around the Citadel is accessible to wheelchair users. Please note that there are cobblestones in the Citadel itself. There are several restaurants and cafés in the area.